ETAGERE: A type of furniture introduced in the beginning of the 19th century characterized by a series of tiered shelves, sometimes with drawers or doors below. It was designed for the display of small objects. The Victorians called their version a “whatnot.” It remains very popular today and has evolved to include open shelving for display that is not necessarily tiered. Billy Baldwin designed one of the most famous etageres for Cole Porter. The firm Victoria & Son, who manufactured the original version, continues to offer an etagere in the Porter style. I have a pair of Milo Baughman etageres in our NYC apartment. This Victorian whatnot features burl wood. In the Victorian period, whatnots often were corner pieces. 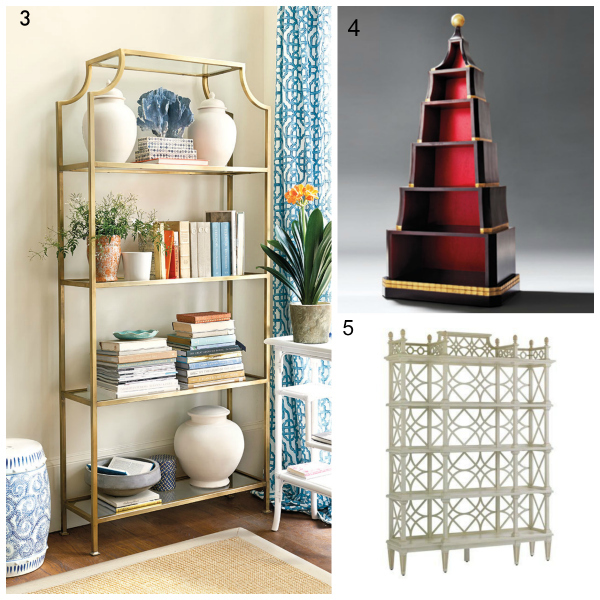 The word “etagere” also describes a tiered serving piece. This serving piece also is known as an etagere. Here are 5 currently available favorites.